There is an abundance of fascinating, charismatic holiday properties in Seville available where you and your friends and family can base yourselves while exploring the city. As in other major Spanish cities, holiday apartment rentals are highly demanded in Seville. The offer is abundant and scattered throughout the city. The advantage of staying in an apartment is to have much more space and all the facilities that you won’t have in a hotel room. This will make you, at least for a few days, feel like a local. All the apartments suggested here are equipped with a kitchen and utensils so you can prepare your breakfast or any meal. It may be a good option for groups of more than 2 people and also for families withchildren. The downside is that, in terms of prices, the apartments are not usually a better deal than hotels of a similar standard. This is particularly true if you are a couple or two travelers. Here’s some of my favorites and suggestions of holiday properties in Seville for you to explore. Q&Q Cathedral Suites: This complex offer stunning apartments with an excellent location, right in the centre of Sevilla’s old town. The facility is extremely secure thanks to a digital keypad lock on both the apartment building and the apartment room itself. The apartments are beautiful, spotless, extremely comfortable, and make a relaxing getaway after long hot days of exploring the city. In addition to this, The rooftop gives you a fabulous view of the Cathedral. Sevilla Central Suites Apartamentos Puerta Jerez: This holiday property offers a shared roof-top terrace, air-conditioning and free WiFi in Sevilla. The monumental area is only a 4-minute walk away. Apartments at this property come with 1 or 2 bedrooms and a bathroom with a hairdryer. Their living rooms are equipped with a flat-screen satellite TV and a sofa bed. Their kitchenettes come with an electric kettle, microwave, coffee machine and toaster. Some apartments include a private terrace with city views. Puerta del Príncipe: Tucked away in the enchanting Barrio de Santa Cruz, a stone’s throw from the Cathedral and its Giralda Tower, Puerta del Príncipe holiday apartments offers a slice of the high life in Andalucía’s most elegant city. Whichever luxurious apartment you choose (2 to 4 bedrooms and 1 or 2 bathrooms), you’ll have outdoor space to enjoy: either a patio or terrace, and some apartments even offer overlook Seville Cathedral itself. Apartamentos Los Venerables: Located in the Old Jewish Quarter, next to the Hospital de Los Venerables, these rental properties are part of a palatial house completely refurbished including six apartments and a duplex apartment. All the charm and the tradition of the original building have been left untouched while offering the best comfort and amenities so you can feel at home. 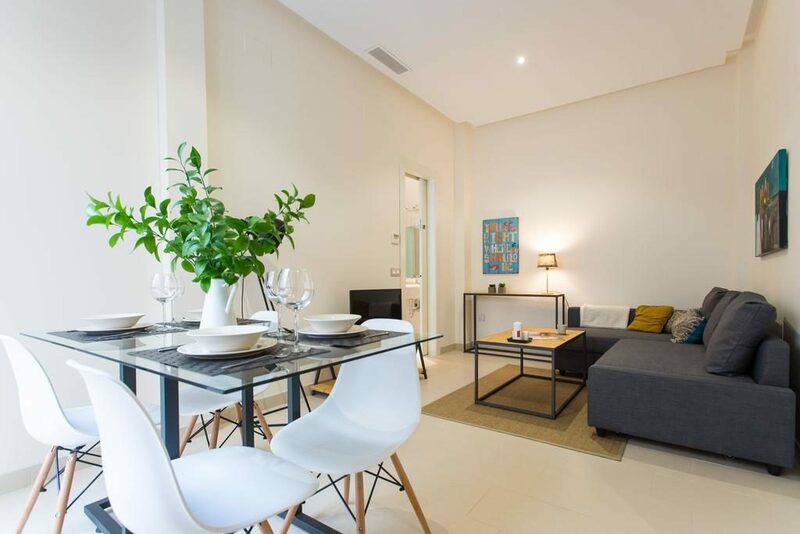 Living Sevilla Centro Maestranza: These apartments are situated in a charming listed building in El Arenal district, and accommodates you in contemporary and stylish wood-floored rooms. There are 1, 2 and 3-bedroom apartments available, all providing a private bathroom, a living room with a double sofa bed, a fully equipped kitchen, a balcony, TV, WiFi, air conditioning, and heating. The Zentral Suites & Apartments: Offering you superior services and a broad range of amenities, the owners are committed to ensuring that your stay is as comfortable as possible. Each modern apartment features 1, 2 or 3 bedrooms and a bathroom with a bath tub or a large shower. Situated in Plaza Europa, just a few steps away from the magnificent Iglesia del Salvador, the area has a variety of traditional tapas bars, as well as lots of shops and several monuments. Puerta Catedral Boutique: Located in El Arenal neighborhood, next to the Bullring, each rental apartment occupies one floor of the building and includes 2 bedrooms, a large living room, a kitchen and 2 complete bathrooms. Some of the apartments also include a patio, a balcony or terrace to enjoy the wonderful climate of Seville. Conde de Torrejón 10: The apartments are located in the center of Seville, in a bustling and lively area called La Alameda. The building has a typical Andalusian courtyard, with a fountain and lots of plants and it offers great panoramic views of the city from the sun terrace. With different sizes, these apartments are for 2 to 6 people; some of them have a terrace or a balcony with a view. You can also use the following search box to look for other holiday properties in Seville.